Last weekend, we had the first annual Aerorama regatta on Lake Arlington. 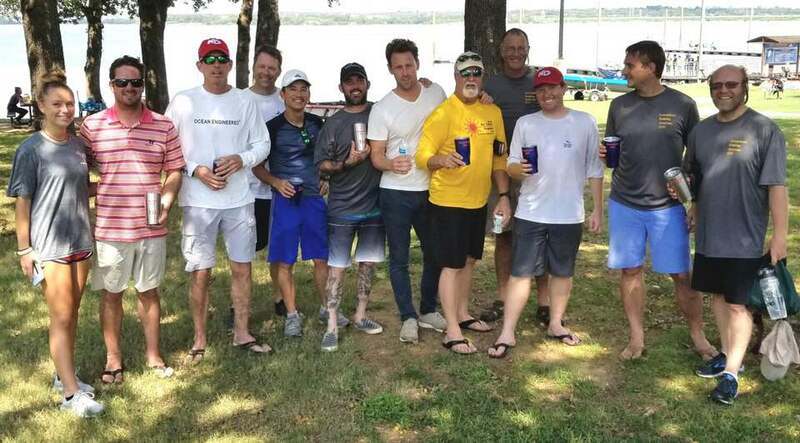 The Arlington Yacht Club in Arlington, TX has hosted a Laser regatta known as Laserpalooza for going on ten years, and since the regatta chairman (me) races both RS Aeros and Lasers, the Laser fleet agreed to having the RS Aeros join the fun! Saturday had light and mega shifty winds. Pete Gregory had a great day getting a second (to Long Ta) in the first race and winning the balance. He actually caught a few Lasers who got a 5 minute head start! Sunday the fleets woke up to glass on the lake. All sailors were disappointed. We had planned a "cage match" race for the last race! Both fleets together - NO HC NO HOLDS BARRED! We went out, but the RC thought better. We ended up having the Laser fleet capsizing each other like they were junior sailors while the Aeros saw the shanagans and got in asap! We hope this starts to gain traction. The City of Arlington Parks and Rec department sponsored the even donating their building and motor boats to be used over the weekend! Jeff Williams the Mayor of Arlington came out to kick off the event. Jeff's a great guy and supports sailing on a great sailing lake right in Arlington! Next year, we will definitely have more from Viridian and hope to see some out of towners join us! Maybe more Aeros than Lasers??? Who knows! I would like to thank everyone who attended and helped make this such a great event!